The strength of a territory. The Tenuta Colombarda vineyards are located in the municipality of Cesena, hamlet of San Vittore (Valle Savio neighborhood, fig. 1), in a particularly lovely area from a morphological and environmental standpoint, winning the hearts of those who have had the opportunity to visit. The estate spreads out over an area nestled into the Apennine mountain range in Cesena (fig. 2), on the left bank of the Savio River (the longest river in Romagna: 78 mi/126 km). It naturally faces the plains and the Adriatic Sea. This area is situated where the beginning of the mountain range meets the plains, just as Dante Alighieri penned, when he wrote about Cesena and its territory: “And she, whose flank is wash’d of Savio’s wave, As ’twixt the level and the steep she lies” (Inferno, XXVII, 52-53). Since the Middle Ages, the first hilly offshoots overlooking the city of Cesena were fertile for the cultivation of grains, fruit trees and vines. Ever since the Middle Ages, the closest hills overlooking the city in the Cesena district have provided fertile land for growing cereals, fruit trees and grapevines (Turci, online http://www.turci.biz/Tesi.htm). When Ravenna became the capital of the Byzantine Empire (6th – 8th century), ‘dominica’ houses were set up in every important agricultural town. These were also known as ‘domnicalia’. These dominica houses were a sort of farm, managed by a deacon of the church of Ravenna known as the dominicus maior. Buzzi (1915) reports the following among the dominica houses in the Cesinate district: “plebe S. Stefani in Giminiano” (8 92); “plebe S. Mariae in Pado Vetere” (908); “plebe S. Viti” (952); “plebe Ss. Gervasi et Protasii “ (957); “plebe S. Tomei in monte Paterno” (1022) and many others. Over the years various, complex factors have shaped the landscape in which Tenuta Colombarda is set, some of which have taken place over many millions of years. For example, the geological and plate tectonics in the Apennine range, the lithology and structure of the rocky sub-strate, the succession of quaternary climate changes, the layout of the natural water supply and, last but not least, human geography. Fig. 1. Tenuta Colombarda is located near San Vittore in the Valle Savio district of Cesena (map extract on 1:100,000 scale taken from the Cesena Municipality SIT website). From a lithological standpoint, the area in question is marked mainly by the surfacing of arenaceous and Miocene pelitic-arenaceous lithotypes as well as the results of their decay and degradation, which in some cases, was due to landslides, as demonstrated by the place name Via delle Motte (fig. 3; motta comes from smottatura, which means landslide). There are widespread and more recent continental deposits related mostly to alluvial terraces of sand and gravel as well as eluvial-colluvial and slope wash, often rather thick, as in the Colombarda 2 vineyard (figs. 2, 4 and 7). The lithological features of the bedrock and the structural and tectonic makeup are related to the origin of the different steepness of the slopes on which the Tenuta Colombarda vineyards sit, with varying steepnesses and selective erosion slopes, which were formed, among others, by the combined erosion of the secondary water network and gravity (figs. 4, 6, 7, 8 and 9). The backbone of these mountain ranges features a surfacing of marn-arenacea, which is a widespread geological formation from Abruzzo to Emilia (Ricci Lucchi, 1986) and in the area in question, goes back to the time between the Serravallian and Tortonian stages (about 14—7 million years ago). 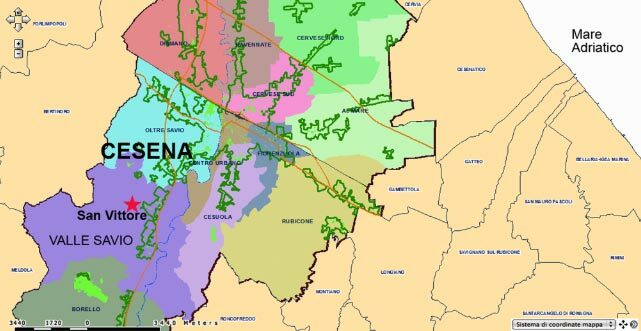 The area (in the province of Forlì-Cesena) is located at the edge of the Apennines-Po Valley and is found on Sheet 255, called “Cesena” of the most recent geological map on a scale of 1:50,000, published by the Italian Map Service, Region of Emilia-Romagna (fig. 5, Benini et al., 2010). The Cesena Apennines, which around Tenuta Colombarda reach just a little over 984 feet (300 meters) above sea level are found in the Apennine Mountains, formed during the Alpine orogeny, the collision between the European continental plate and the Adria microplate, which is connected to the African plate. Fig. 2. Tenuta Colombarda is located on Via Colombarda in the hamlet of San Vittore (the area circled). 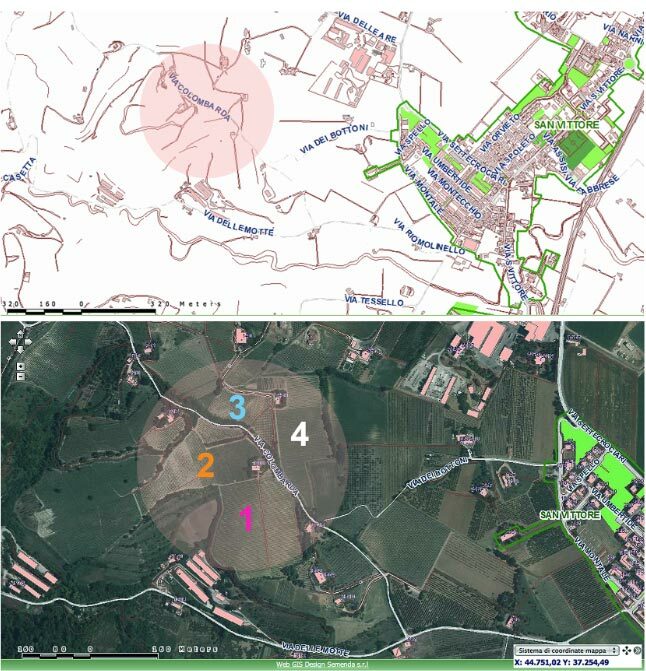 In the aerial photo, the areas marked numbers 1 through 4 are vineyards and were researched in this report (from the city of Cesena’s online Territorial Information System). Fig. 3. 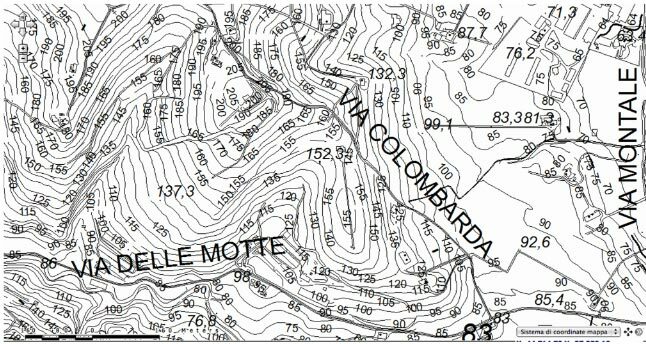 The place name of Via delle Motte, near Tenuta Colombarda close to Via Colombarda (from a map extract on a 1:25,000 scale, from the city of Cesena’s online Territorial Information System). Fig. 4. 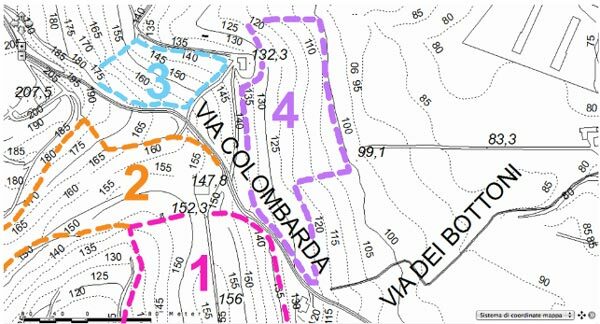 Geological map of the Tenuta Colombarda area: 1 through 4 company vineyards. FMA 12a: marn-arenacea formation, Member of Castel del Rio; AES5: Subsynthem of Torre Stagni; AES6: Subsynthem of Bazzano; a2b,g: deposits of slope wash due to landslides and colluvium, in red when it is active, in blue if dormant (map extract on a scale of 1:25,000, from Emilia-Romagna’s online geological map service). Fig. 5. Extract of a deep Geologic Section across the Savio River where San Vittore and Cesena are located. The types of recent continental deposits are indicated. (Mod. from Sheet 255 “Cesena”; Benini et al., 2010). The collision, which involved the Sardinian-Corsican range of the European plate, began in the Tertiary period (middle-to-late Eocene era, 45–37 million years ago), after the Piedmont-Ligurian basin had finished closing off, a process which had begun in the early Cretaceous epoch. Starting in the Oligocene epoch (30–28 million years ago), compressive deformation led to the formation of a chain-foreland system that migrated through time and space, from west (Tuscan Domain) toward east (Umbria-Marche Domain) and throughout the peninsula all the way to the Adriatic Sea. Turbidite sedimentation formed in the foreland (Ricci Lucchi, 1990) and during the Miocene epoch when the front of the chain reached the Umbria-Marche Domain, a new foreland basin opened where marn-arenaceous deposits formed (Ricci Lucchi, 1986). After the compressive phases responsible for the stacking of the main tectonic plates of the Apennine chain, an extensional tectonics process began, moving over time from southwest to northeast, leading to a partial breaking up of the previously created structural edifice through a series of normal emergent faults, mainly toward the west. The marn-arenaceous formation, which is part of the Umbria-Marche-Romagna succession, is one of the most powerful and larger turbidity units in the northern Apennines. It is made up of sandstone, siltstone and resedimented marlstone via turbidity currents that were caused by underwater landslides, earthquakes and storms, in a long, thin marine basin on the end of the Apennine chain in formation (foreland). The sedimentation axis of this basin went in the direction of the Apennines (northwest-southeast – west-northwest ­– east-southeast), moving northeast over time, with a resulting deformation of the chain and the formation of overlapping bodies of folds and overthrust moving toward the Adriatic foreland and then northeast (Boccaletti et al., 1980). Regionally speaking, the authors have subdivided the marn-arenacea area in fourteen parts characterized in general by a variable lithological relationship between sandstone and pelite in the turbidite deposits. In the Tenuta Colombarda area, the marn-arenacea surfaced as a part of Castel del Rio (fig. 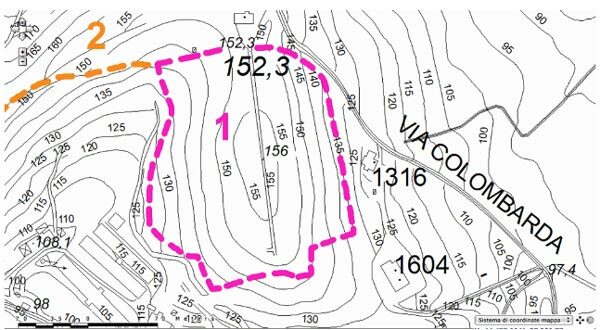 4: FMA 12a) and can be seen along the slopes on the edge of the areas cultivated for use as vineyards, on the western side of area 1 (fig. 6), south of area 2 (fig. 7) and north of area 3 (fig. 8). From a lithological standpoint, this part of Castel del Rio is made up of arenaceous and pelitic turbidites with incredibly varied lithological characteristics. Specifically, in the area in question, we can see feldspathic sandstone, from coarse to refined and not very solidified, organized into beds with widths that range from decimeters (vineyard 3, fig. 8) to meters. The most powerful beds, sometimes with a microconglomerate base, have pelitic inclusions and appear as a mix of layers that are different meters in width (Vineyard 1, fig. 6). Furthermore, in the area in question, there are late Quartenary alluvial deposits that can be traced back to the Emilia-Romagna Supersynthem from the middle Pleistocene-Holocene age (about 650,000 years ago BP–Present). 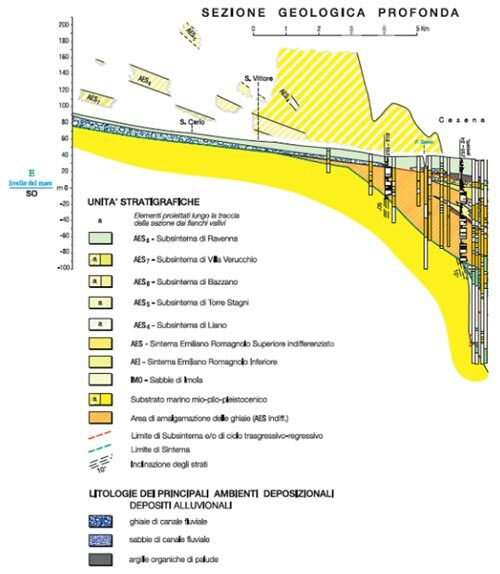 The Emilia-Romagna Supersynthem is the stratigraphic unit that includes the Quartenary deposits that surfaced on the edge of the Apennines in the Po Valley and in the relative sediments in the subsoil of the Emilia-Romagna plains (Martelli, Amorosi, Severi, 2009). Fig. 6. Topographic movement of the slope upon which the vineyard marked “1” (map extract on a 1:2,000 scale from the city of Cesena’s online Territorial Information System) was established. The evolution of the contour lines suggests the presence of an area of rolling terrain, at about 509 feet (155 meters) above sea level, characterized by terraced alluvial deposits from the Subsynthem of Torre Stagni, which declines quite quickly toward slopes (western edge) and shelf breaks (eastern and southern edges). Fig. 7. Topographic movement of the slope upon which the vineyard, marked “2” (map extract in 1:2,000 scale, from the city of Cesena’s online Territorial Information System) was established. The disjointed, irregular evolution of the contour lines suggests shelf breaks and the incline that characterize the morphology of this slope. Fig. 8. 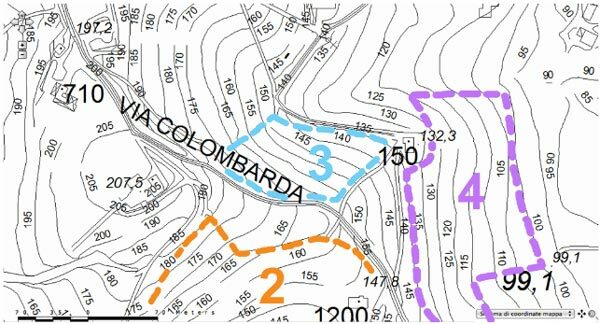 Topographic movement of the slope upon which the vineyard, marked “3” (map extract in 1:2,000 scale, from the city of Cesena’s online Territorial Information System) was established. The quite regular distribution of contour lines suggests an inclined monoclinal tendency toward northeast that characterizes the morphology of this slope. Fig. 9. Topographic movement of the slope upon which the vineyard, marked “4” (map extract in 1:2,500 scale, from the city of Cesena’s online Territorial Information System) was established. 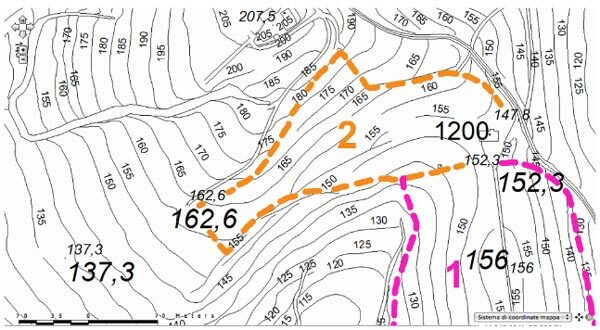 The distribution of contour lines suggests an inclined monoclinal tendency toward east, sometimes interrupted by reduced inclines that characterize the morphology of this slope. In the area in question, the lower Emilia-Romagna Synthem does not emerge; thus, the terraced alluvial fan deposits seen refer to the upper Emilia-Romagna Synthem (middle Pleistocene period). The two different terrace deposits that emerge in the area and that were mapped on Sheet 255 “Cesena” (fig. 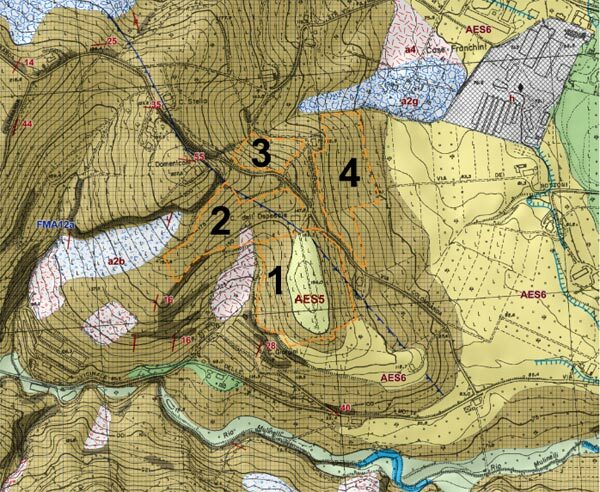 4: AES5 and AES6) are located in two altimetrically distinct zones that are separated by a slope related to the evolution of the secondary water network controlled by what occurred in the phases after the tectonic uplift of the Appeninic margin. The terraced alluvial deposit is very much eroded as seen at the top of the Colombarda 1 (fig. 4.6) area. It is made up of a reasonable depth of sand and sandy loam with fine to medium-sized gravel that is not very abundant, making for a pedogenized yellowish-brown soil (10YR 2.5 on the Munsell Soil Color Chart). On Sheet 255 “Cesena,” this deposit was attributed to the Subsynthem of Torrestagni, for similarities relative to the stratigraphic and morphologic position as compared to deposits of the sample locality on Sheet 220; while deposits marked as AES6 belong to the Subsynthem of Bazzano (Benini et al., 2010). In the vineyard shown as area 2 (fig. 4.7) one can see an eluvium-sandy, colluvium-silty deposit that is limited in size and faintly pedogenized, making for a yellowish-light brown soil (10YR 6/2 on the Munsell Soil Color Chart). Benini A., Cibin U., Cremonini G., Martelli L., Severi P. (edited by), 2010. Note illustrative alla Carta Geologica d’Italia alla scala 1:50.000. Foglio 255 “Cesena”. Servizio Geologico d’Italia – Regione Emilia – Romagna. Boccaletti M., Coli M., Decandia F.A., Giannini E., Lazzarotto A., 1980. Evoluzione dell’Appennino Settentrionale Secondo un nuovo modello strutturale. Mem. Soc. Geol. It, Vol. 21, 359 – 373. Buzzi G., 1915. La Curia arcivescovile e la Curia cittadina di Ravenna dall’ 850 AL II 18 . Bollettino dell’Istituto Storico Italiano, 35. Martelli L., Amorosi A., Severi P., 2009. Note illustrative alla Carta Geologica d’Italia alla scala 1:50.000. Foglio 221 “Bologna.” ISPRA, Servizio Geologico D’Italia. Regione Emilia – Romagna. A.T.I., 124 pp. Ricci Lucchi F., 1986. The Oligocene to recent foreland basins of the northern Apennines. In: P.A. Allen and P. Homewood (Editors), Foreland Basins. Spec. Publ. Int. Assoc. Sedimentol., Vol. 8, 105 -139.